The Community Health Promotion concentration prepares students to examine the social, behavioral, and environmental determinants associated with the most pressing health problems. Students learn to design, implement, and evaluate appropriate health promotion programs and preventive services to improve population health. 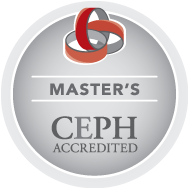 The curriculum and practical experiences for this concentration prepare students for the Certified Health Education Specialist (CHES®) exam. The Epidemiology concentration prepares students to investigate and analyze factors that influence the occurrence, distribution, prevention, and control of disease. Emphasis is placed on the development of such skills as study design, data collection and management, data analysis and interpretation, and communication of research findings. The Food Security and Nutrition concentration provides public health students with the knowledge and skills necessary to implement food security and nutrition programs and policies within a global public health context. Students will explore and apply the definitions, means of measurement, and policy implications of food security and nutrition through a multidisciplinary approach. This concentration emphasizes the role of food security and nutrition in public health at the local, regional, and global levels. This concentration requires applicants to have taken at least one undergraduate nutrition course (e.g., NUTR 295). The Global Health concentration prepares students to apply the tools of public health to the promotion of health in communities, countries, regions, and the world. Concentration coursework emphasizes comparative global health metrics; the socioeconomic, environmental, and other risk factors associated with transnational health concerns; and ethical and effective strategies for preventing and controlling infectious and non-communicable diseases in diverse populations. Students gain professional communication skills and develop competencies in program planning, implementation, monitoring, and evaluation. The Health Policy concentration addresses the nature and importance of policy and policymaking in today’s public health system. Through course work and opportunities for practical application, students are introduced to the context and process for policymaking in public health, including the current political, economic and legal environment for health policy, and the basic elements of the public policymaking process and government payment systems. Students graduate with the knowledge and abilities needed to engage with public health and advocacy organizations on policy issues, and to analyze and support policy approaches in an era of scarce public resources and ever-changing priorities. The Public Health Communication concentration prepares students to effectively use communication strategies to inform and influence individual and community decisions that affect health. This highly specialized concentration links the fields of communication and public health and is increasingly recognized as a necessary element of efforts to improve personal and public health. The public health communication concentration emphasizes designing, evaluating, and implementing effective communication strategies and messages to address the health needs of diverse audiences. The Public Health Practice concentration (100% online) advances the competencies of public health practitioners and other health professionals to fulfill their roles and responsibilities in local, state, and federal public health agencies and non-governmental health-related organizations. Students in this concentration examine the social and environmental factors associated with improving population and community health with a focus on the application of evidence-based public health concepts. This concentration requires two years of full-time work experience in a health-related field prior to application. This concentration is offered fully online and students cannot take classes on campus. Learn more about the Public Health Practice concentration. Our Master of Public Health (MPH) graduates pursue career opportunities in a variety of employment settings, including public agencies, non-profit organizations, academic and research institutions, and the private sector such as health systems and private consultant management firms. While each concentration has a different focus, the program prepares students to pursue careers as epidemiologists, environmental health officers, program managers, health promotion specialists, health scientists, and policy analysts, public health officers, and more. The Community Health Promotion concentration prepares students to design, implement, and evaluate appropriate health promotion programs and preventive services to improve population health. Graduates often gain employment as health promotion specialists to work in local, state, and federal public health agencies, non-governmental health organizations, the health care sector, and private industry. The Epidemiology concentration prepares students to investigate and analyze factors that influence the occurrence, distribution, prevention, and control of disease. Graduates from our epidemiology program often pursue careers as epidemiologists in local, county, and state health departments, federal agencies, and in the private sector working for pharmaceutical companies and private consulting firms. Graduates of the Food Security and Nutrition concentration implement programs and policies within a global public health context. They pursue careers as public health nutritionists in local and state health agencies, nutrition subject matter experts, nutrition digital content managers, nutrition advisors, and nutrition educators. The Global Health concentration prepares students to apply professional communication skills and develop competencies in program planning, implementation, monitoring, and evaluation on a global scale. Graduates from this program often work with U.S. and international governmental agencies, non-governmental organizations, and relief agencies as epidemiologists, project officers, public health advisors, and health education specialists. Health Policy graduates have the knowledge and abilities needed to engage with public health and advocacy organizations on policy issues, and to analyze and support policy approaches in an era of scarce public resources and ever-changing priorities. Graduates from this program pursue careers as health policy analysts for official health agencies, non-governmental health organizations, professional/trade groups, professional health societies, health systems, insurance companies, and private consulting firms. Public Health Communication students effectively use communication strategies to inform and influence individual and community decisions that affect health. Graduates from this program pursue careers as health communication specialists, managers, consultants, health writers, and public affairs officers for local, state, and federal health agencies and in the private sector such as consulting management firms. Graduates of the fully online MPH in Public Health Practice develop skills in disease prevention, community-based participatory approaches, health assessment, planning and evaluating interventions, risk communication, and leadership and management. Students in this program typically have several years of experience in a health-related field and are looking to advance their careers by pursing more senior leadership positions. Meet an alumna of the MPH program.